Investors in fixed income securities, like all investors, expect to earn a reasonable return over time. However, what is considered a reasonable return can change with market conditions and investment time horizons, among other factors. When market conditions become volatile, investors’ time horizons shorten meaningfully and what constitutes a reasonable return can also change. This has clearly been the case on several occasions since 2008. Presented in this first chart is the interest rate on a 10-year Treasury bond since 2007. Noted are four macro events that created heightened uncertainty, market volatility, and lower US bond interest rates (flight to quality). During each of these events, investors’ idea of a reasonable return was driven more by capital preservation than anything else. Adding to the drama and uncertainty during this entire period was the Federal Reserve’s quantitative easing programs. During 2012 and 2013, macro conditions improved. Concerns about the viability of the Euro were addressed (at least for now), a more conciliatory mood settled over Washington DC (at least until the next election) and the Federal Reserve began tapering its quantitative easing programs. The improving macro environment has boosted investor confidence and has allowed investment time horizons to stretch out. This has brought higher interest rates and improved stock market valuations. However, we do not believe the recovery of investor confidence is complete. Presented in this second chart is the real 10-year Treasury rate (real equals Treasury rate minus core inflation) for the last 20 years. 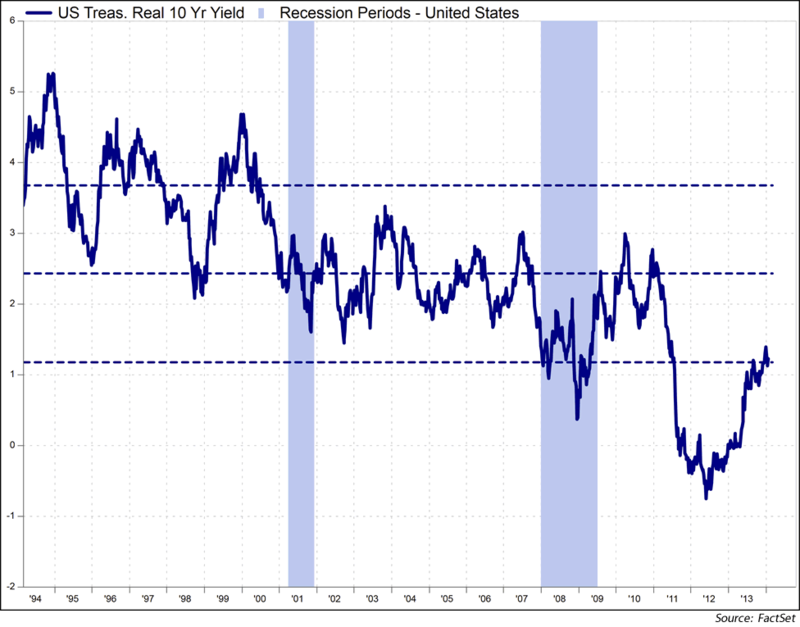 During this period, investors in this bond have been provided an average real interest rate return of about 2.5%. In other words, the “normal” real interest rate return has been 2.5%. Even following the last “Great Recession”, investors in this bond received about a 2% real interest rate return. Currently, the 10-year Treasury bond interest rate is about 2.7% and the real return (after core inflation) is about a 1% real rate. This is still 1.5% below the longer-term average or more normalized rate. 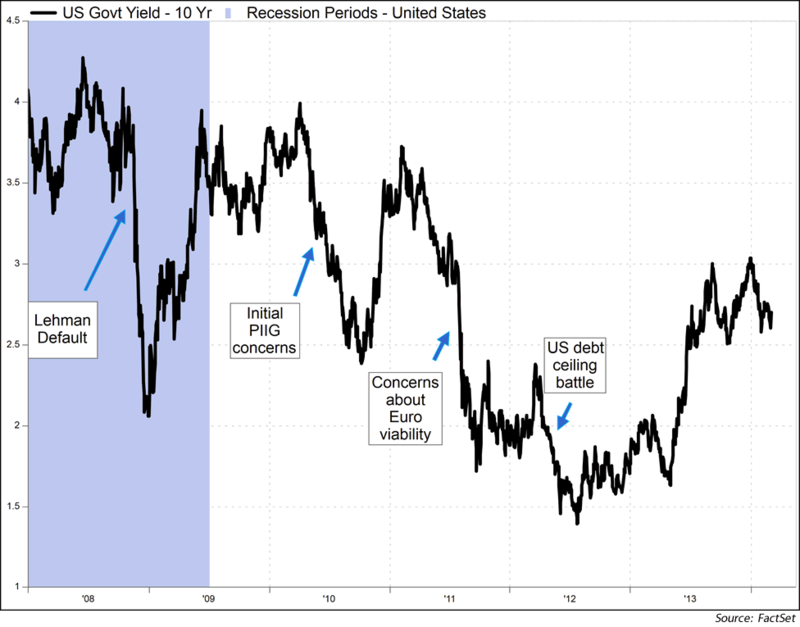 If investors start to demand an average real interest rate return on 10-year Treasuries of 2.5% and core inflation stays near its current 1.7% level, the 10-year bond will need to rise to above 4%. This thought process implies existing bond holders will see meaningful losses on top of the losses already experienced in 2013 (rates rise = prices fall). Historically, an investor (not a trader) in the 10-year Treasury bond has earned an average real interest rate of about 2.5%. We think this real return is reasonable and will be achieved as investor confidence continues to improve and macro conditions normalize. In our view, events in 2013 were the first step in this normalization process, but there remains further progress to be achieved. This suggests interest rates will move higher, and a defensive bond structure remains appropriate.